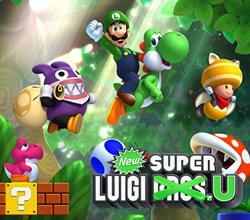 Please note that the release dates above are for the downloadable content version of New Super Luigi U. The "hard" retail copies of New Super Luigi U came out later on, late in July for Europe and Australia and on the 25th of August in the United States. New Super Luigi 2 continues a series of Luigi themed titles in the Super Mario Bros series of games for 2013 "The Year of Luigi" and was originally announced by Satoru Iwata during a Nintendo Direct broadcast originally aired on February 14th 2013. The setting for the game is much like the original NSMB U, though this time the task of rescuing the Princess falls onto Luigi's shoulders, as Mario is nowhere in sight (if you look carefully however you can see Mario's cap on a table at Peach's castle - bad timing on the bathroom visit Mario). Playable characters include Luigi as the primary protagonist, Yellow and Blue Toads and the new edition of Nabbit; The rabbit who steals from the Toad Houses in New Super Mario Bros U - this character however can only be played in the multiplayer version of the game. The game will feature 82 levels which we expect will be modified renditions of their New Super Mario Bros U predecessors and one of the main differences to gameplay will be the physics of Luigi as a character compared to Mario. Luigi as a character can jump higher than Mario, and run faster - but he is a bit less co ordinated, and the combination of the quicker speed, higher jump coupled with the setbacks of longer stopping distance and worse co ordination could end in disaster for Mario's clumsier brother. A video from Nintendo of Japan showing the new physics of Luigi in action, and comparing them to Mario's in NSMB U.